Fill up your store with everything you’ve been working on to give your customers the biggest selection of products. Show off your products with big and beautiful photography. Your customers want to see what they’re buying, so more images can make a big difference. Always know how many products you’ve sold, how many are left in stock, and have products automatically marked as “Sold Out” when they’re gone. Keep your customers in the loop with automatic emails when you’ve shipped out their orders, and even share tracking numbers. Powerful and flexible discount codes offer you a variety of ways to market new products, promote your store, and reward loyal customers. Make quick changes across multiple products, orders, or discounts. Update shipping prices, change the status of products or orders, and more. Use any domain you own to give your store a custom URL. Turn a URL like radtees.bigcartel.com into shop.radtees.com. Want to see who’s linking to you, what people are searching for, which browsers they’re on, and much more? Try our Google Analytics integration on for size. Power up the MailChimp integration by automatically including a popup newsletter subscription box in your shop, and advertise new discount codes in your newsletters. No long-term contracts or commitments here! The changes to your account will take effect right away. Plans are month-to-month only, there’s no annual option. This keeps things flexible for you and your shop’s needs. Head to the Account section in your admin. Click Edit your plan & billing. Select the plan you want to use. Enter your payment details and follow the on-screen steps, and you’re set! 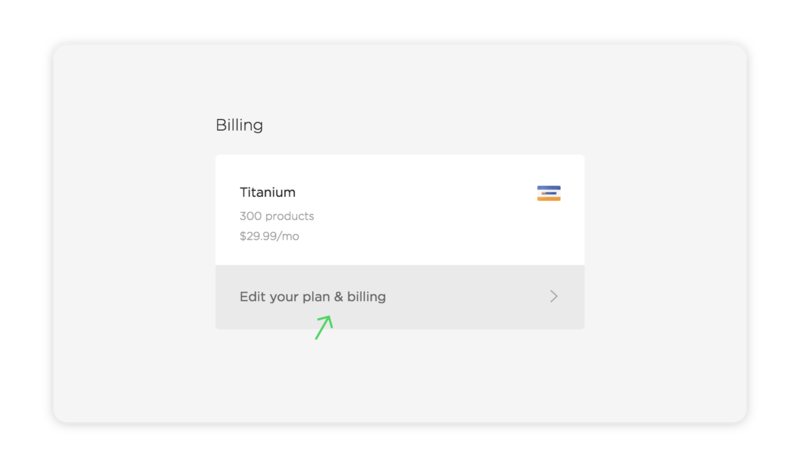 Tap Edit your plan & billing.